showers), it's still warm here in Estonia. Perfect excuse for eating lots of cold summer soups. My cold soup repertoire isn't huge, I must admit. I love Ximena's gazpacho (and will be making it again and again in a week or so, when our tomatoes are ready). 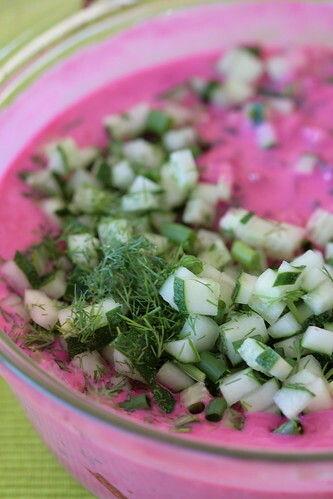 I also love this simple cold kefir soup with herbs and radishes. But radishes are finished for this year, so I needed a new cold soup recipe. The recipe here is slightly adapted from this Russian foodblog, and we loved both the flavour as well as the stunning colour. Our little daughter, who's almost 1 year and 6 months now, heartily approved as well!! I love roasting the beets, as this gives them an exceptionally sweet and earthy flavour. If you're short for time, then this works with boiled (and even ready-grated and vacuum-packed) beets as well. Wash the beets, wrap in foil and roast in a 200 C oven for about 45 minutes, until cooked through (test for doneness by piercing with a sharp knife). Cool completely, then peel and grate coarsely. Hard-boil the eggs, then cool under cold water. Peel and cut into half lengthwise. Take a large bowl, throw in the grated beets. Stir in some of the kefir, then season the soup base with horseradish and some salt and pepper. Add the rest of the ingredients, except boiled eggs. Taste again for seasoning - you may want to add more salt or pepper, or perhaps even some lemon juice. Keeps well in the fridge for a day or two. I can never get used to see a pink/red colored soup, no matter how cute they are. I adore kefir and even ventured into making my own. paired with beetroot a great idea pille! I am Lithuanian and make something similar, but use buttermilk instead of kefir, and don't use horseradish. I have also been adding some julienned lovage leaves, adds a nice tang. I think we've had it almost every day for the last three weeks, with the heat and all. Traditionally this is served with boiled potatoes, I also like to serve it with home fries. We have the same soup in Poland - it is cold "chlodnik litewski" - Lithuanian cold soup, because it came to Poland probably from Lithuania. 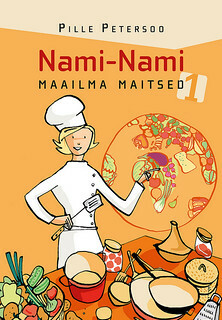 However, it is now a part of Polish culinary culture (I presented it some time ago). Delicious soup, worth recommendation! Tantei - you're loosing out on many excellent soups then -beetroot borscht, tomato gazpacho, Russian solyanka etc. Meeta - I haven't made my own kefir yet, but our daughter drinks almost a litre a day, so we always have some in the fridge :) I bought some kefir bacteria in France last summer - should make some myself soon! 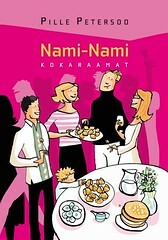 Saule - welcome to Nami-Nami and so nice to hear from you! I'll keep the lovage tip in mind - we've got plenty in our garden (PS lovage = leeskputk). 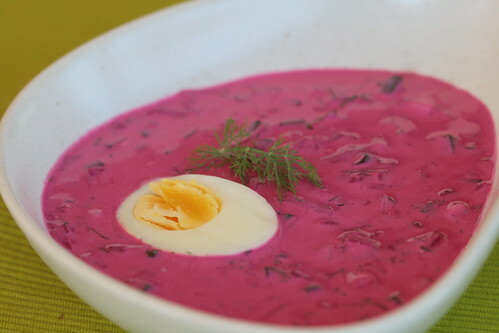 There are several versions of cold beetroot soups - I'll try to make a more authentic Lithuanian version as well. Jana Z - ma täitsa usun. Leedukad lisavad vist hapendatud peeti oma šaltibaršciai jaoks? Magdalena - I saw your version as well, looks delicious! I remember my mum making Okroshka, similar to this, it's a called soup, made with potatoes, cucumbers, but also some sausage (frankfurter variety, or a garlic sausage) - with a mix of sourcream and kefir. difficult to get by kefir in London, but I'm using yoghurt. Katrina - I've made okroshka as well, but not with kefir. I prefer using kvas for that. However, there's a huge variety of the same cold soup, so the possibilities are endless. One of my favorites! In Israeli hot summer days!! It's not bad with a fried fish fingers. It was very hard to find kefir. Taste of this soup is very original. Alina - interesting to read that it's also eaten in Israel! BeefLover - good of you to give the soup a go! Just came back from Riga, Latvia where I enjoyed a fabulous beet soup! Can't wait to make your recipe! !